Quickly lose weight and gain muscle with the Multi Functional Home Fitness Machine by Joyfay. 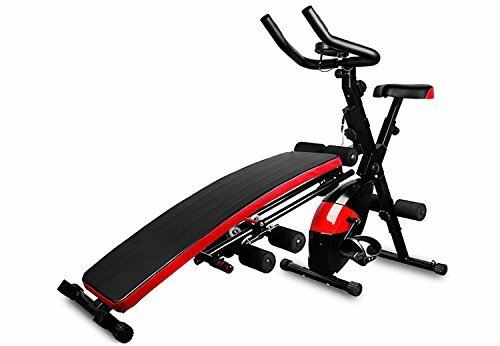 This remarkable home fitness device combines an ab glider, exercise bike, and an exercise bench into one compact piece of equipment. The Multi Functional Home Fitness Machine is lightweight and easy to assemble. You can assemble it in under 20 minutes. The state of the art design will allow you to work virtually every muscle group. Core exercises, arm exercises, and even leg exercises are all possible with our home fitness machine. With this product there is no need for weights, it uses your own bodyweight as resistance for the ab glider so you don't have any extra strain on your muscles. This makes this product safe for people of all ages and skill levels. The LCD display will track the amount of time that you've been exercising, the calories that you've burned and it will also read your pulse while you are exercising. Our Multi Functional Home Fitness Machine is easy to store and a great addition to anyone's personal home gym. If you have any questions about this product by Joyfay, contact us by completing and submitting the form below. If you are looking for a specif part number, please include it with your message.